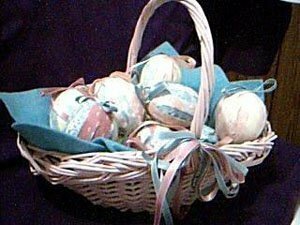 You can create unique fabric covered eggs to decorate your home for Easter, staring with some plain foam eggs and fabric of your choice. This is a guide about making fabric covered Easter eggs. Fill a basket with these easy and pretty fabric-covered foam eggs. Cut fabric into half-inch wide strips. Vary the fabrics on each egg for an interesting look. Mix solids and prints as desired. 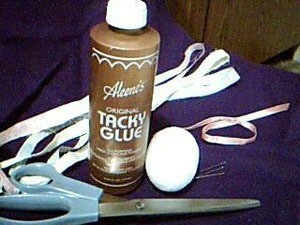 Choose your first fabric strip, apply a dot of glue to one end, and place it at the thick end of a foam egg. Pin it in place, right through the glued end. Wrap the strip long-ways around the egg several times, leaving blank spaces for another fabric. Continue wrapping vertically until you reach the end of the fabric strip. Glue in place at top of egg and cut off excess. Repeat with a second fabric strip, and then a third. You will need about three 30 inch strips for each egg. Make a figure-eight bow out of a 12 inch piece of ribbon and pin it into the egg where all the fabric strips ended. Pile eggs in a basket or attach a ribbon loop and hang on an Easter tree.